One of the best ways to keep dogs cool during the hot summer months is to use a cooling mat or bed. They come in a variety of sizes, and many can be used both inside and outside the house or in a kennel. 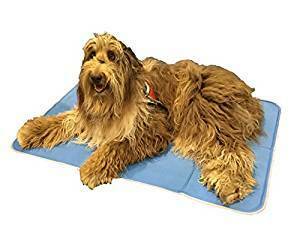 It is very easy for a dog to become overheated and these mats can cool your pet down quickly and keep them comfortable for hours. There are a few things to be aware of to find the best product for your situation. In this post, we cover what you should look for when shopping for a cooling mat, as well as give you some recommendations regarding the best products on the market. This Arf Pets solid-gel pad is a great option to help your pets stay cool. It is lightweight, budget-friendly, and easy to clean. 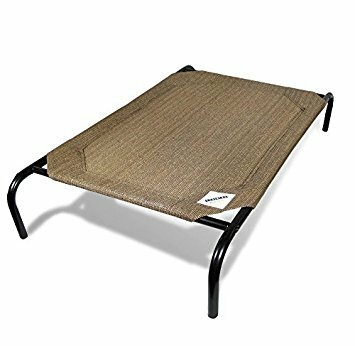 It is useable as a standalone mat, in a kennel, or on a dog bed. It can be used inside or outside and can stay cold for around three hours with 15-20 minutes recharging time when not being used. It has a slight cushion for comfort and folds up easily to move around your house or to take with you when you travel. It comes in 3 sizes, is puncture proof and is non-toxic. The Green Shop is another standard option if you are looking for a good quality, low maintenance cooling pad. It folds up easily for storage or if you want to take it with you on a trip. It is also non-toxic, and the vinyl cover is easy to clean. It will stay cold for up to three hours and will recharge itself in 15- 20 minutes if it isn’t in use. It comes in five different sized and is very sturdy. 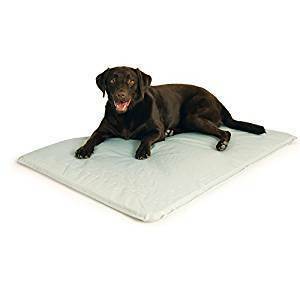 A slightly different style that is an excellent option for dogs with medical conditions that need a lot of cushioning, but also needs to stay comfortable temperature-wise is the Dogbed4less Orthopedic Gel Cooling Memory Foam Dog Bed. This bed is suitable for medium to large breed dogs. It has easily removable, washable covers, with a gel within the foam that should help to keep your pets cool and comfortable in the warmer months. K & H make a lot of different types of pet beds, including heated indoor and outdoor beds. Their most popular cooling product for dogs is the Cool Bed III. Versions of this bed have been around for years; this latest version has a stronger material (heavy vinyl backing with a nylon coating) than previous versions. It is one of the few pads that is water-based rather than gel-based (you fill the pad with water only once when you first get it). The Cool Core of the pad absorbs the dog’s natural body temperature and radiates it back into the air. It is useable inside or outside (in the shade only), and it comes with a two-year limited warranty. One thing to note with this pad is that it has a strange problem where if you lift or move the bed by its corners the foam core interior separates from the sides, causing it to become lumpy and impossible to smooth out. To avoid this problem, you have to fold the bed in a certain way if you are planning on moving it. Durability– Obviously you will need a mat that can stand up to any rough treatment your pet may put it through. Biting, chewing and scratching at the pad are all pretty normal behaviors for a dog. 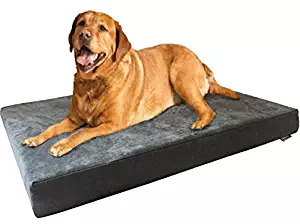 Most pads are designed to withstand a small amount of chewing and scratching, but if your pet is a bit more on the destructive side than most, you may want to skip the mats altogether and look at a product like the Coolaroo bed (listed below). For those who have a cat in the household with sharp claws, punctures are something that you may need to think about. A couple of the pads claim to be puncture proof, although that is kind of tough to guarantee. Material– The best cooling pads are made of a Nylon fabric and are latex free. It is pretty hard to get an indestructible material, but Nylon can hold up to most of the worst wear and tear from pets while at the same time being breathable. Avoid any types of beds or mat that contain plastic, foam, or rubber, as they will cause your pet to sweat. Cleaning – Mats do tend to collect dirt and drool from dogs that are panting and sweating; it can make for a gross combination. You will want a product that is easy to clean. All of the pads that we have listed are easy to wash with a damp towel or sponge and mild dishwashing detergent. You CANNOT put these cooling products into a washing machine. If you are worried about bacterial growth while storing a pad over the winter, some manufacturers recommend using a few drops of grapefruit seed extract into the water you are applying for cleaning. Sizing– Finding the right size of pad for your pet is going to be one of the most challenging aspects of shopping for this type of product. Most companies have many different sizes available. If you are unsure of what size will suit your dog, all you need to do is measure out the area that they take up when they are lying on their sides with their legs stretched. Once you have figured out how much room they are taking up, add a little bit of space to that measurement, and you should be able to get a general idea of what size to get. Inside/ Outside– Most pads can be used indoors or outside. If they are in use outside, they must be kept out of the direct sunlight and off flooring that can get hot like asphalt. Weights of the pad- Generally cooling pads are lightweight and easy to fold up for storage or travelling. One exception to this is the Cool Bed III. Since the Cool Bed III is full of water, it can get pretty heavy and is not intended to be moved once it is filled. Length of time it will keep your pet cool– Another important thing to consider is how long the pad will keep your pet cool. An acceptable length of time is around three hours, with 15-20 minutes to ‘recharge’ when not in use. Water vs. Gel filling– Most of the cool pads have a non-toxic gel filling. The gel-filled mats are lighter and more convenient, but if you are worried that the gel may leak, you might want to stick with the mats that have a water filling. The mats work by absorbing the heat from your dog’s body and dissipating it into the air, so your dog stays comfortable. The pads don’t generally feel cold to the touch, but they will be cooler than your dog’s body. The gel in most of the cooling pads is water-based with a polymer. When you apply pressure to the polymer gel, it becomes activated and can pull heat from the body. When the force is removed (i.e., the dog gets up from the mat), there is no longer any heat to absorb, and the polymer gel can recharge itself. The main benefit is that these types of pads will keep your pets cool in the heat. Some of the pads have a little bit of cushion to them; they are more comfortable than sleeping directly on the floor. If you have a dog who is suffering from Cushing’s disease, they will be able to get a bit of relief from these types of products. If you are using the pad indoors, the best place to put it would be in an area with good airflow and a type of hard floorings like a tile, linoleum or concrete. Make sure there are no sharp objects near the pad that may puncture it. If you are using the bed outdoors, you must put it in a shady area out of the direct sunlight. Since there is some chance of the pads becoming damaged or leaking there are a few basic things you should do to make sure you will get years of use out of the product. First, make sure your dog’s nails have been trimmed to help prevent punctures. You should also ensure that the mat is placed on a smooth surface with nothing underneath that may cause it to puncture or rip. If you put the pad on a hardwood floor check it regularly to ensure that no condensation or moisture may damage your floors. Even though it is tempting, never place these types of pads in direct sunlight. If they are used outside place the pad in a shady area. If you put it in the direct sun, it will become hot. Finally, if your pet has begun to use the mat in a particular area, try not to move it, so your dog gets used to using the pad and becomes attached to it. If none of the mats that we have listed meet your needs, here are a couple of different options to help your pet stay cool and comfortable in the heat. 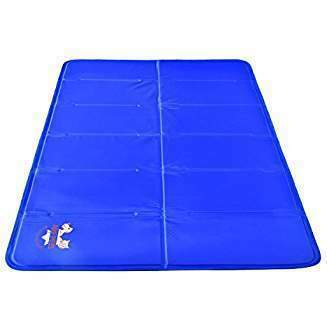 If you aren’t so keen on the mats, you may want to have a look at this cooling bed. The off-the-ground design means that your dog will have better airflow all around the bed. 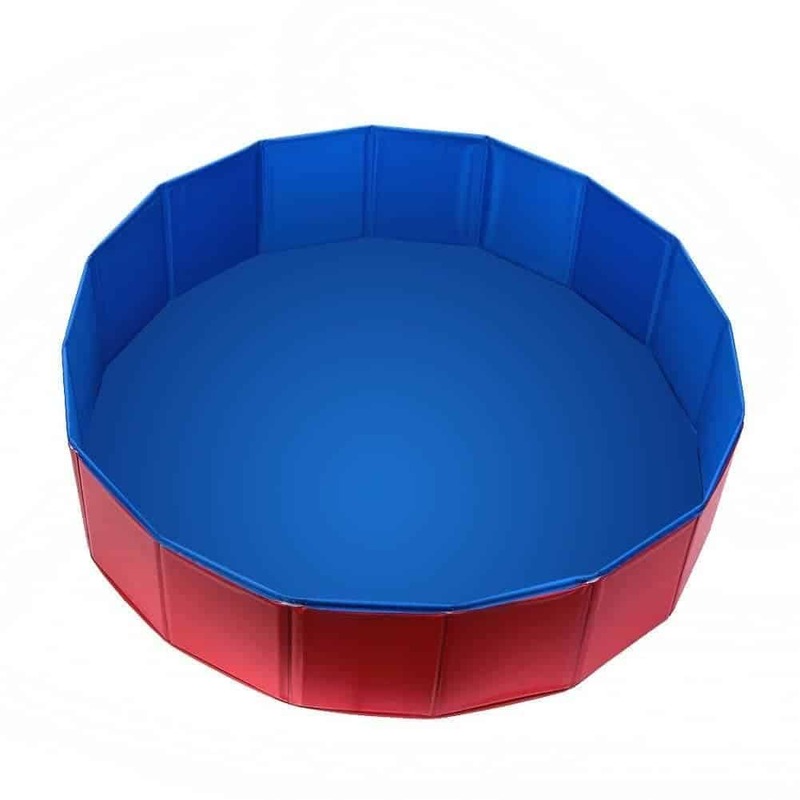 This design is elevated 7 inches off the floor and uses a breathable high-density polyethylene fabric that is comfortable and cool. The bed comes in three different sizes (S,M and L) and you can choose from five different colors. It is easy to clean, and the material is flea, mite, mold and mildew resistant. The manufacturer claims the bed can be set up in 5 minutes, although many users reviews state that the bed can be challenging to set up and you may need to refer to some YouTube videos for assistance. Getting your pet a cooling vest is another great way to help them beat the heat, especially while out walking or playing. 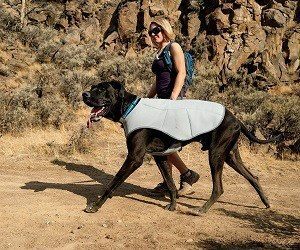 This vest from Ruffwear is a clever design that uses evaporative cooling to keep your dog at a comfortable temperature. All you need to do is soak the garment in cold water, wring it out and then put it on your dog. As the water heats up, it vaporizes and lowers the temperature of the air surrounding the vest, in turn keeping your dog cool. It is an excellent product for dogs who overheat and have a lot of trouble being outside in the summer. It comes in 6 sizes so it should fit almost any breed. If you need to cool your pet down quickly an excellent way to do this is to have them submerge themselves in a pool, or body of water. If you don’t have a body of water nearby, check out this dog swimming pool. It is great because it is made of pet-friendly material and you can use it for a quick cool down spot. It can also be used to bath your dog, so you don’t get your bathroom soaked in wet dog water. It comes in 4 different sizes and can fold up for easy storage or travel. Leave pets indoors with air conditioning if possible. If the pet must be left outside, make sure they have lots of water and a shady spot. Only walk your pet in the early morning or late evening when the temperature is more bearable. To cool your dog quickly, provide a pool of cold water for them to stand in. You can also cool them down quickly with a wet towel. Avoid over exercising your pets. No one wants their dog to be uncomfortable when it is hot outside. There are many products that can help keep your dog cool and give them some relief from the heat all your pets healthy and comfortable even in the hottest, most humid conditions. Remember to inspect any cooling mat that you get for damage and never place it in direct sunlight.